CHICAGO, April 15, 2015 – The Loyola University Museum of Art (LUMA) presents three exhibitions this summer from artists Richard Renaldi, Timothy J. Clark, and Andrei Rabodzeenko. Touching Strangers, In the Presence of Sacred Light, and Technotropic Romance open May 23 and run through August 2. In Touching Strangers, Renaldi creates spontaneous and fleeting relationships between strangers for the camera, often pushing his subjects beyond their comfort levels. These relationships may only last for the moment the shutter is released, but the resulting photographs are moving and provocative, raising profound questions about the possibilities for positive human connection in a diverse society. The exhibition causes us to reflect on the power of human touch and face-to-face interaction—especially in an age when digital communication is a primary tool for social interaction. Renaldi was born in Chicago in 1968 and graduated from New York University with a BFA in photography in 1990. He has presented solo exhibitions both in the US and abroad, including at Fotografins Hus, Stockholm; Robert Morat Galerie, Hamburg; and Yossi Milo Gallery, New York. Renaldi’s work has also appeared in group exhibitions, including Strangers: The First ICP Triennial of Photography and Video at the International Center of Photography, New York (2003). Touching Strangers is Renaldi’s third book, following Figure and Ground (Aperture, 2006), and Fall River Boys (2009). LUMA is proud to present this exhibition in partnership with Loyola University Chicago’s School of Social Work. This exhibition was organized by Aperture Foundation, New York. Curator: Ann Pallesen, Gallery Director, Photographic Center Northwest, Seattle. The traveling exhibition Touching Strangers was made possible, in part, with the support of the Robert Mapplethorpe foundation. In the Presence of Sacred Light: The Master Watercolors of Timothy J. Clark presents over 40 paintings by an artist who has honed the craft of watercolor. Clark concentrates on the small moments that cause us to pause and take in what is around us. “The exhibition recalls the era of the Grand Tour, when 19th-century artists, writers, and tourists—especially Americans—traveled through Europe and the Near East, recording their impressions in sketchbooks and journal,” said Pamela Ambrose, director of the Loyola University Museum of Art and cultural affairs at Loyola University Chicago. Clark reproduces the quality of light that varies from city to city. Paris has a blue-tinged light; New York City’s sky is gray, running to lilac; Southern Italy basks in a golden glow; and Southern California, a tangerine brightness. The artist’s work is represented in numerous public collections, including the Butler Institute of American Art, Youngstown, Ohio; El Paso Museum of Art, Texas; Farnsworth Art Museum, Rockland, Maine; Museum of the City of New York; National Portrait Gallery, Washington, DC; Springfield Art Museum, Missouri; and the Whistler House Museum of Art, Lowell, Massachusetts. 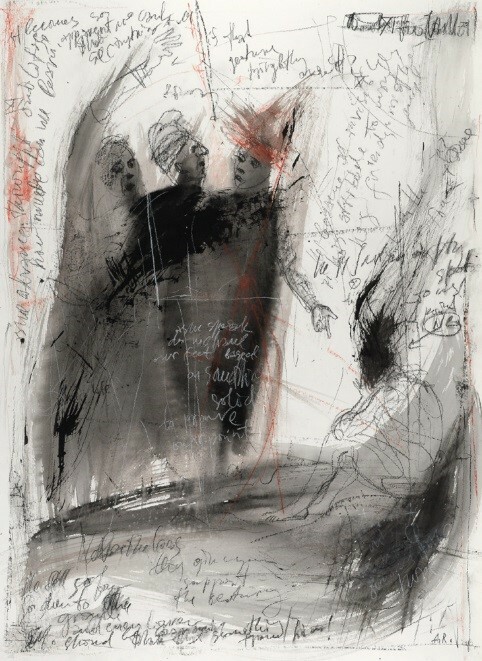 side of being, something that is beyond verbal vocabulary.” These graphic works—executed in charcoal, photography, ink, and ink wash—incorporate written word and embody impromptu, spontaneous action. Rabodzeenko also presents two Biblical references from the Old Testament: The Tower of Babel and the Book of Job. Both series are illustrated using a controlled palette of black, white, and red. Since emigrating from the Soviet Union in 1991 where he trained, Rabodzeenko has become recognized as an emerging Chicago artist. He has participated in several group exhibitions, including: Not Just Another Pretty Face, a show of commissioned art exhibited at the Hyde Park Art Center; Background, an exhibition of four Ukrainian artists at the Butcher Shop; and Bratwurst, a presentation of prominent Chicago artists mounted in Philadelphia. For additional information on these exhibitions, museum hours, and more, visit LUC.edu/luma. All events take place at LUMA, 820 N. Michigan Avenue, Chicago, Illinois 60611. 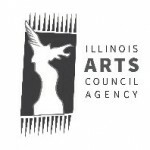 Program are generously sponsored by a grant from the Illinois Arts Council Agency. Tuesday, May 26, 6 p.m.
Renaldi will discuss Touching Strangers, his unique photography series that has resulted in spontaneous and fleeting relationships between strangers for the camera, often pushing them beyond their comfort levels. He will talk about his experience working with subjects on the street—both moving and awkward—and the possibilities for positive human connection in a diverse society. General admission is $5. LUMA members and Loyola students, faculty, and staff are free. Thursday, May 28, 6 p.m.
Clark will discuss five decades of painting, the medium of watercolor, and the inspiration of light. Free with museum admission. General admission is $5. LUMA members and Loyola students, faculty, and staff are free. Join LUMA members and staff to celebrate the opening of the summer exhibitions. A celebratory dinner will follow the reception. Reception general admission is $15. LUMA members and Loyola students, faculty, and staff are free. The dinner is $100 per person or $150 per couple. Dinner RSVP required by Friday, May 29. Saturday, May 30, 1 p.m.
Clark will tour visitors through his exhibition In the Presence of Sacred Light while discussing his career, the influence of light on his work, and a lifelong interest in exploring the relationship between humans and their environment. Free with museum admission. Tuesday, June 2, 6 p.m.
Shweta Singh, PhD, professor at Loyola’s School of Social Work, will explore the idea of ‘touch’ as a communication technique, its culture and gender-based parameters, and how that differs in diverse cultural contexts. General admission is $5. LUMA members and Loyola students, faculty, and staff are free. Tuesday, June 16, 6 p.m.
Jeanne Sokolec, PhD, professor at Loyola’s School of Social Work, will discuss how strangers are often those we fear because they may be different from us, or an unknown entity. Yet, over the centuries we have been taught that it is our duty to embrace strangers with graciousness. General admission is $5. LUMA members and Loyola students, faculty, and staff are free. Opened in 2005, the Loyola University Museum of Art is dedicated to exploring, promoting, and understanding art and artistic expression that illuminates the enduring spiritual questions of all cultures and societies. The museum is dedicated to helping people of all creeds explore the roots of their faith and spiritual quests. The museum is located at Loyola University Chicago’s Water Tower Campus, and occupies the first three floors of the University’s historic Lewis Towers on Michigan Avenue. For more information, please visit the museum’s website at LUC.edu/luma. 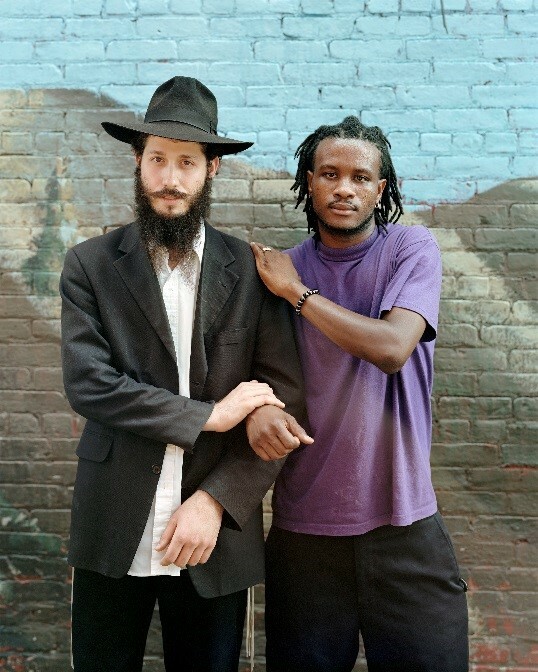 Shalom and Jeff, 2013, Brooklyn, NY, from Touching Strangers (Aperture, May 2014). © Richard Renaldi.